Sign Up for New Product & In Stock Announcements! Vintage Roadside t-shirts feature authentic vintage advertising images for people who love road trips, historic preservation, roller derby, vintage signs, rockabilly, hot rods, burlesque, mid-century architecture, vintage tattoo art, & great stories. Ranging from a WWII skating rink pin-up to a Florida roadside attraction, Vintage Roadside's vintage advertising graphics capture the attitude, humor, and artistic style of 1930s - 1960s roadside America. Click on an image in our Gift Shop to read the history of each vintage mom and pop roadside attraction, motor court, motel, tiki lounge, drive in restaurant, roller skating rink, or bowling alley t-shirt. 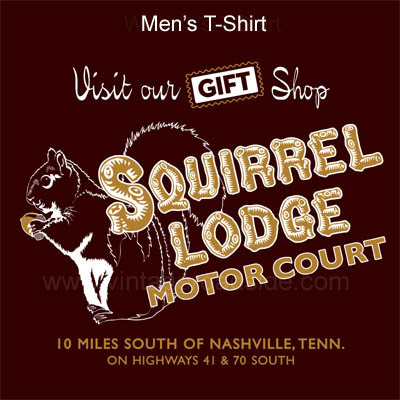 Our Squirrel Lodge shirt is now back in stock! Click on the image below to order yours! Craving a road trip adventure, roadside giants, or vintage neon signs? Find those and much more on Vintage Roadside's blog and Flickr page. Share your road trip photos & stories with us! We love road trip photos and hearing about the places you love! Join us on our Facebook page here and tell us about your can't-miss places! Vintage Roadside’s screenprinted t-shirts are 100% cotton and are available in both men’s and women’s sizes, from small to XXL.